VFL in 60 seconds: Round 2 Watch a 60-second snapshot of Collingwood&rsquo;s VFL round two clash with the Casey Scorpions at the Holden Centre. Dale Tapping addresses his side during the VFL Magpies' loss to Casey at the Holden Centre. Undermanned and understrengthed, Collingwood's VFL side has been overcome by the Casey Scorpions at the Holden Centre. Collingwood appeared the better of the two sides in the first half and took a 15-point lead into the half time break. However with as little as two rotations on the bench for the entire game, Dale Tapping's side couldn't maintain the intensity. Rotations were affected from the start, with Collingwood beginning the game with just 21 players. Lachlan Ferguson, Ash Close and Jonathon Marsh were all removed from the extended squad due to injury, while Brent Macaffer and Matthew Goodyear were held as carry-over emergencies for the afternoon's AFL clash. When Jesse White was chosen to replace Tyson Goldsack in the AFL team, the VFL Magpies were left short with just over half an hour until the beginning of the game. 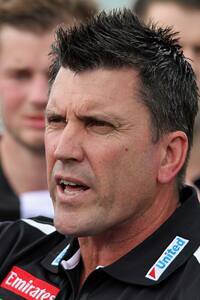 "We went into the day with 22 players," VFL general manager Luke Gatti told Collingwood Media. "When Jesse was taken out of our squad half an hour before the opening bounce, we weren’t comfortable to reducing that number to 21." "We added Dale Hinkley who played a full game yesterday for the Uni Blues. He came from Geelong today to make it to the game at half time. It’s a strange way to debut but it was a great effort on his behalf." Thanks to United Petroleum, Collingwood Media is giving the Magpie Army the chance to have their say in the VFL fan vote. Add your opinion to the poll below and watch this week's edition of 'From Lulie Street' to see the winning player. With just two players on the bench, Collingwood were unable to prevent Casey from piling on successive goals in the final quarter. Holding a three-point lead at three-quarter time, the Scorpions kicked nine goals in a row before Lachlan Howe broke the streak in the final minutes of the game. Exhausted Collingwood players were helpless as the vistitors continued to attack. They were incredibly accurate in front of goal as the game quickly slipped away. The final quarter surge shouldn't have come as a great surprise to Dale Tapping and his coaching staff. Last week Casey kicked 12 goals in the final quarter as it defeated Frankston at Casey Fields. Given the status on the interchange bench, the Magpies could ill afford to lose a player to injury. Unfortunately this was the case in the early stages of the first quarter when Corey Gault clashes heads with Casey's Melbourne-listed defender Oscar McDonald. Both players lay dazed in the forward 50 at the Hisense Arena end of the ground as the umpire stopped play. They walked off the ground, however it was the last sighting of Gault for the day. After undergoing a concussion test in the second quarter, the tall forward emerged from the rooms after half time in his club tracksuit. When Collingwood were competitive for the first three quarters of the game, they largely had two young defenders to thank for it. Tim Broomhead and Rupert Wills both played fantastic games in the midfield. Big-bodied draftee Wills possessed the strength and grunt, while Broomhead added class and poise. A 2015 Rising Star nominee, Broomhead kicked Collingwood's first goal of the day before directly having a hand in two others before half time. A constant impresser at VFL level, Jack Hellier was also named in Collingwood's best players for a strong showing around the ground. Dale Tapping's side was even balanced with 11 VFL-listed players joining 11 on the Magpies' AFL list. While Hellier was arguably the pick of the bunch, a number of others impressed. For the second consecutive games Jordan Kelly was named in the best players, while he was this week joined by fellow defender Jackson Viola. After three games as 23rd man in 2015, Viola showed strength and clever decision making in his 2016 debut. Former Port Melbourne defender Matthew Smith was impressive, while Dale Hinkley drove from Geelong to play the second half - despite playing a full game of local football for the University Blues on Saturday. Recap Collingwood Media's live chat of today's game in the module below. *Marty Hore is Collingwood's nominated 23rd man. The 23rd player rule is designed to enable clubs to promote young talent and provide them with a taste of VFL football to aid their development.